Building an email list is the single most important thing you can do for your online business. It’s the most lucrative and effective form of online marketing. But unfortunately, it’s far from easy. If you’ve been building your list one by one, you know how tricky it is! In part 1 of this 6-part series, we looked at the 11 highest converting sign-up forms and where to place them. But what should you use to entice people to sign up? A free eBook? A report? A webinar? 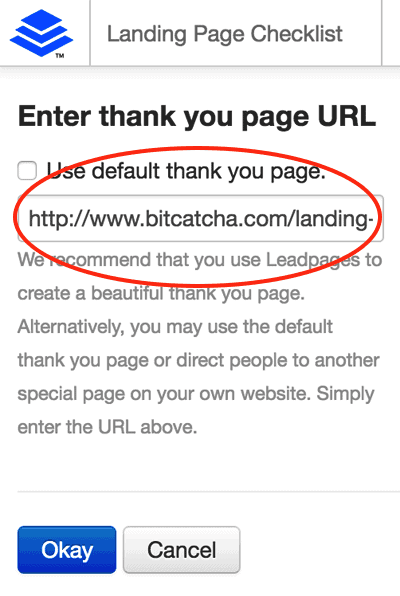 I use it here on Bitcatcha and it’s the most effective capture form on the site. And I’m not the only one. 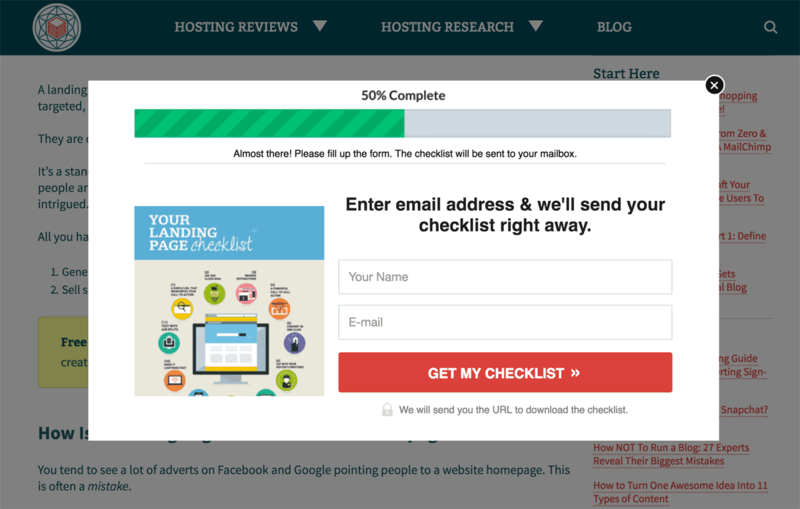 Some bloggers are reporting HUGE increases in signup conversions using the content upgrade method. You’ve all seen the traditional ‘lead magnet’ or incentive to entice people to subscribe. It’s often an ebook or report on digital marketing. In the past, they converted really well. Nowadays, these large resources are less effective. They’re usually too general. Too broad. Too big. Plus, we’ve all got free ebooks piling up in our inbox, so we’re reluctant to download any more! Instead, your readers are looking for something else. Something more relevant, specific, and better tailored to their needs. Something they really want to download. Right now, you’re here reading this article about growing an email list. So I know for sure that email marketing is your focus and interest. Why would I try to push a broad eBook on social media marketing? Or SEO? Or anything else? I know you’re interested in email marketing, so I need to offer you something related to emails. That’s where the content upgrade comes in. It’s a lead magnet that is highly relevant to what your visitor is reading and it offers extra value beyond the blog post. It slots right into the content, so you’re already engaged and intrigued when I offer it. Here’s what it looks like in situ. So here’s the trick. 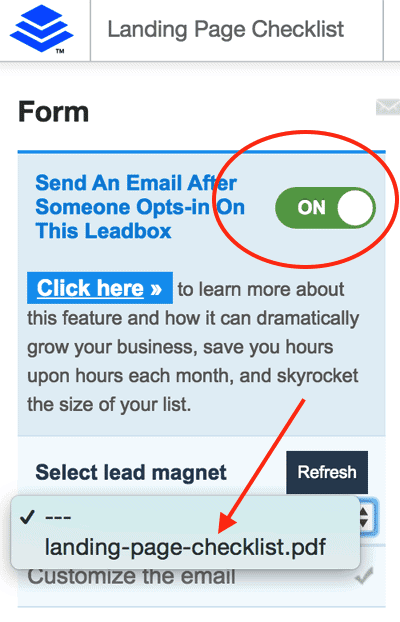 Don’t offer one general ‘lead magnet’ across your whole site. Forget eBooks, white papers etc. Instead, create lots of smaller incentives tailored to different topics. Obviously, it takes time to create bespoke additional content, but they can be bite-sized. It could be a printable checklist that summarises the post, a video explainer, or a more detailed case study. Anything that adds value to the existing content. Bottom line: Don’t offer something general that your readers might want. Offer something valuable and relevant you know you want. That’s the content upgrade in a nutshell. You ‘upgrade’ the content in exchange for an email. 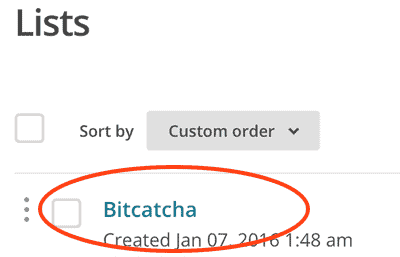 Here’s an example of how the content upgrade works here on Bitcatcha. I started by choosing a high traffic blog: this article on ‘landing pages’. Since it was generating a good deal of visitors and converting quite well already, it was a strong candidate for converting even more subscribers. The post itself is a long (2,000 + word) resource, so I decided the ‘upgrade’ should be a simpler checklist that summarised the main points. 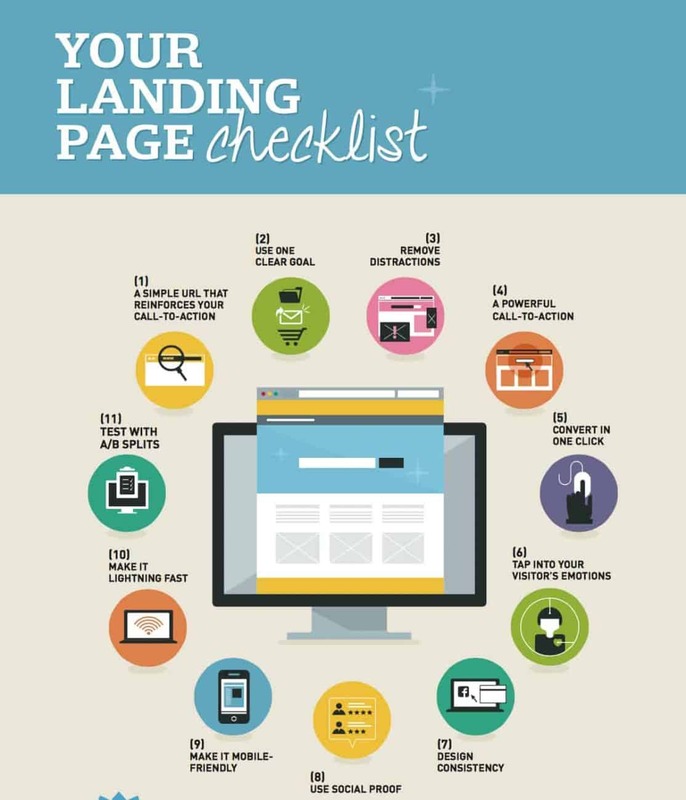 I wanted something my readers could print out and refer to when they were creating their own landing pages. Something that provided real, actionable value. I positioned the opt-in link right at the top of the blog, so you absolutely can’t miss it. I also embedded it at the bottom of the page, so there are two clear entry points. You’ll also notice it’s wrapped in a bright yellow box. It draws the eye. The reader feels compelled to click on it. I was also keen to make sure the content-upgrade looked great. A few bullet points on a Word document didn’t seem like a fair exchange for my readers. This infographic is far more effective. It makes sure my subscribers feel like they got something of value in exchange. They could print it out and refer to it while building a landing page, for example. Before I explain the step-by-step process of setting one up, here are a few alternative content upgrades that you can easily create yourself. 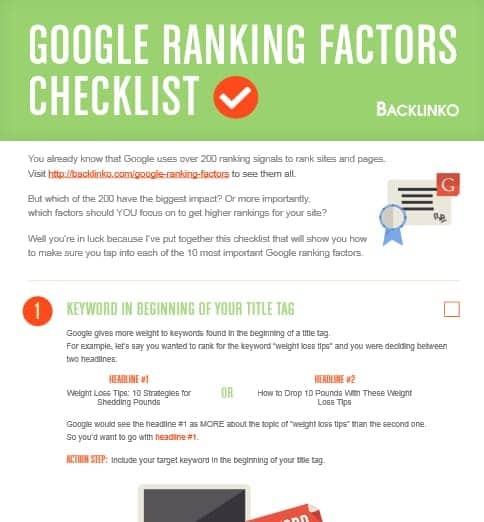 Like a checklist, cheat-sheets work really well for long-form blog posts. Blogs like this one – at nearly 2,500 words – are a lot to take in. So you can take all the important points, boil them down, and let your readers ‘cheat’. These are great when your main piece of content is a video or content. Your readers can download the transcript and save it for later. Blogs are often an introduction to a topic. You can use the content upgrade to go into even more detail. A case study is intriguing because it lets readers see how the theory works in action. Your readers will love a quick hack, especially if it relates to what they’ve just read. You could give away a free email template or a sample spreadsheet for productivity. Web designers could offer raw PSD files for their readers to modify. Digital Marketer do a similar thing with a ‘swipe file’. You simply copy and paste their formula-tested existing social media headlines. Find your highest traffic blogs. 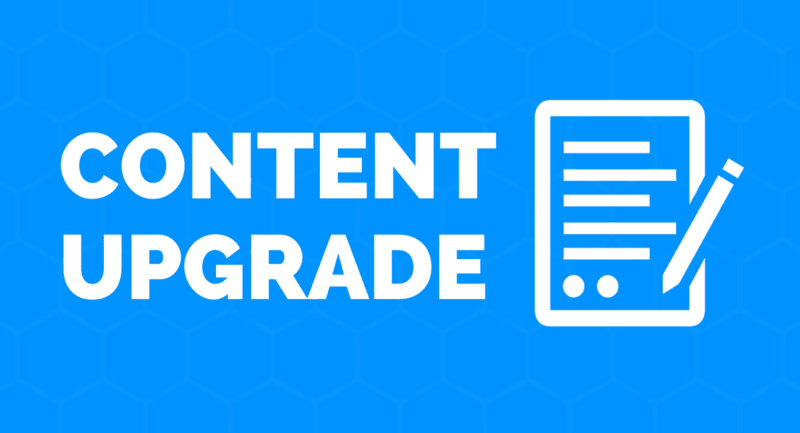 Create a content upgrade for each that adds value. Tweak and optimize the conversion rate. Drive tons of traffic to it. Watch your subscriber numbers skyrocket. Sounds simple, but there are a few tricky bits to set up. Finding your highest traffic blog is the easy part. Generally, the articles with the most traffic will generate the most subscribers. Dive into your Google Analytics account now and write down your five top performers. Now choose a content upgrade incentive that will add real value. You can pick one of the content upgrades I suggested above, or come up with something completely new. The more creative and unique, the better! Here’s the trickiest part, but I’ll take you through it step-by-step. Before we start, you’ll need an account with LeadPages and MailChimp. These are the two tools we’ll use to set up your content upgrade. Why use this LeadPages pop-up box? Because it converts 30-40% better than sending people away to another landing page. It’s also eye-catching and dynamic. MailChimp is the email software that collects and manages all your subscribers. It also blasts out your newsletters and mass emails. Let’s say one of my readers, Ben, fills out my LeadPages pop-up box. To do this, we have to link the accounts up. LeadPages does have a general video about doing this, but for content upgrades, things are a little more detailed. Here’s the problem: one reader may download a content upgrade on emails, and one may download an upgrade on social media. But I want to store both those subscribers in the same overall email list. And that’s a bit tricky. One simple list that collects all your subscribers. But make sure each subscriber gets the specific content upgrade they clicked on. I’ve spoken to a lot of bloggers who were setting up tons of different subscriber lists for every content upgrade. That’s a nightmare. We just want one. We avoid that by creating ‘sub-sections’ of your main subscriber list. 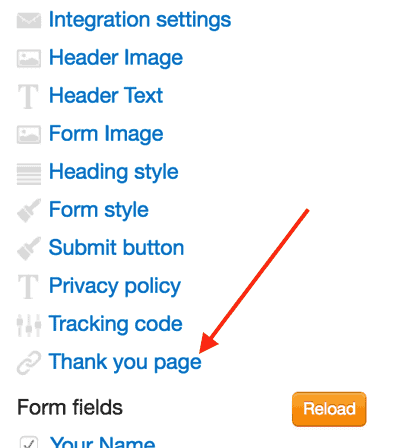 MailChimp calls these ‘list fields’, and we create one for each content-upgrade. That way, everyone gets the incentive they signed up for, but they are all fed into one main subscriber list. Remember, this ‘list-field’ is like a sub-section of your larger subscriber list. We’ll name it after each content upgrade you’re setting up. In my case, this is a content upgrade for the ‘landing page’ blog. You also want to UNCHECK the ‘visible’ field. That’s MailChimp all set up. Now, we need to give LeadPages all this information. 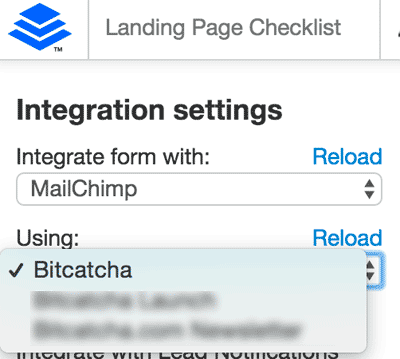 Integrate MailChimp with LeadPages so all email addresses are collected. 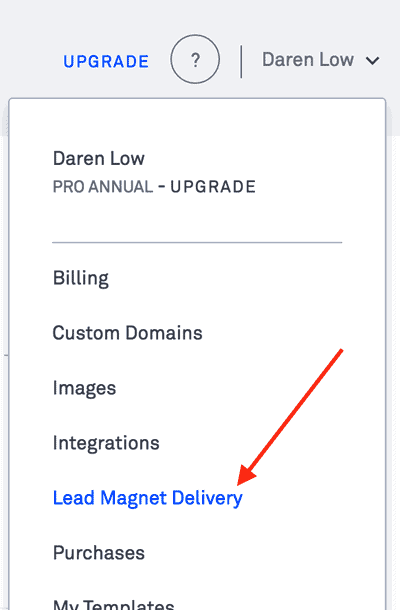 Make sure LeadPages tells MailChimp to categorize subscribers according to the content upgrade they received. In my case, I would choose ‘Bitcatcha’. 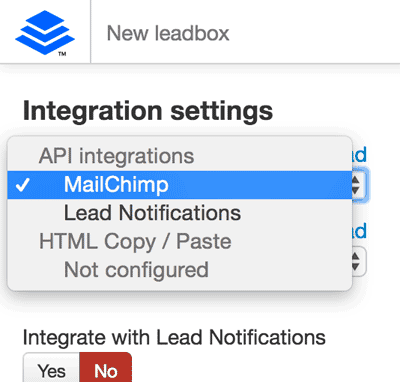 Now, any email address collected by a Leadpages box will automatically be stored in my MailChimp subscriber list. But how do we make sure the subscriber gets the right content upgrade? 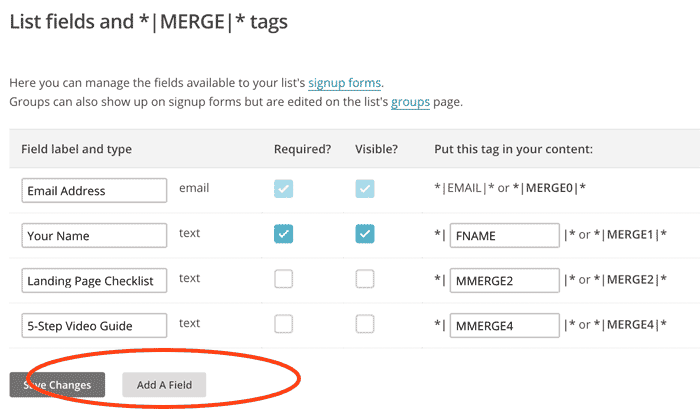 Here, we’ll input the ‘list-field’ we created in MailChimp. That hooks up the correct content upgrade with the correct pop-up box. 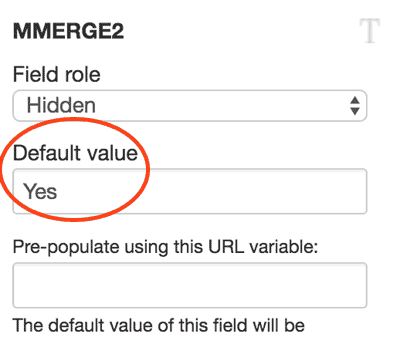 Head to the ‘form fields’ section, and look for the ‘hidden form fields’ at the bottom. 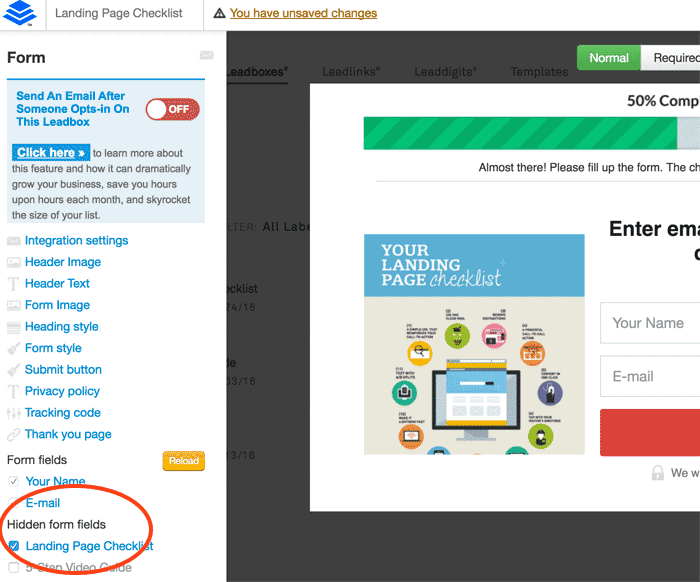 This is where we find my ‘Landing Pages Checklist’ field I created in MailChimp. This final step is crucial. It means a ‘yes’ will appear in your MailChimp subscriber list next to anyone who downloaded a content upgrade. Essential if you want to avoid sending your subscribers the same content twice! Now for the fun part – designing your pop-up box. This is the point where we start optimizing your conversion rate. Everything about your Leadbox must be carefully considered to BOOST CONVERSIONS. Think about your copy, the images, and the all-important ‘call-to-action’. We’d need a whole extra blog to cover these specifics. Luckily, we have just the article! Read our ‘Seven Steps to a Magnetic Call to Action’, and make sure your pop-up box is driving as many people to convert as possible. All that’s left to do is get this up and running on your site. This needs copying and pasting into the HTML of your blog post. In my case, I head into the WordPress backend, find my ‘landing pages’ blog, and load up the HTML. In the image above, do you see there’s a line of text hidden in the HTML that says ‘Click here to subscribe to my mailing list’? So the HTML will wrap the wording you’re using. Now, when someone clicks on that link, the pop-up box appears. At this point, we’re nearly there. 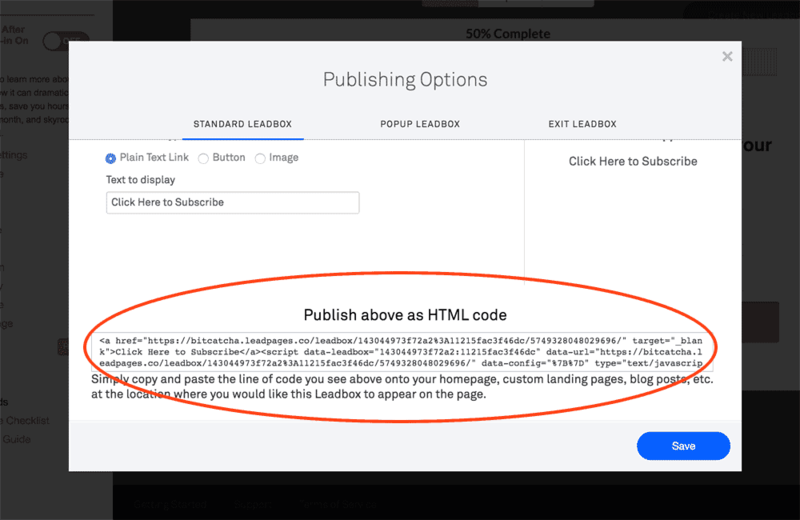 With this method, when your new subscriber hits the ‘submit’ button, LeadPages automatically sends the content-upgrade via email. At the same time, it stores that new email address in MailChimp. When a subscriber hits submit, they’ll be added to your MailChimp subscriber list, and LeadPages will instantly send them your content upgrade by email. Rather than sending them the content-upgrade via email, you can instead send them to a landing page where they can download it. This is also simple to set up, and we do it with a thank you page. LeadPages is entirely dedicated to creating awesome landing pages. Play around and use one of their templates to build one you’re happy with. You can then include a link to download your content-upgrade. Or if it’s a video or webinar, you can embed it right there on the landing page. If you don’t do this, LeadPages will send your subscriber to a generic ‘thank you’ page, and they won’t get their content upgrade. Now we really are done. With our content-upgrade set up, we now have a highly converting subscriber funnel and an awesome lead magnet for readers. Drive some serious traffic to it! Once you’ve tested the content upgrade and tweaked it to achieve a strong conversion rate, you can scale it up. 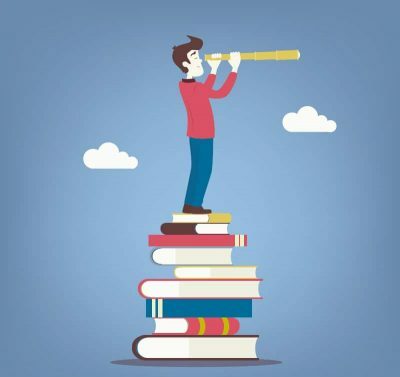 I like to drive traffic to the post via Facebook ads, usually at a cost of $0.433 per visit, and let my highly-converting ‘upgrade’ turn my visitors into subscribers. Are you using the content upgrade technique? I’d love to hear about your experiences and whether it works for you.